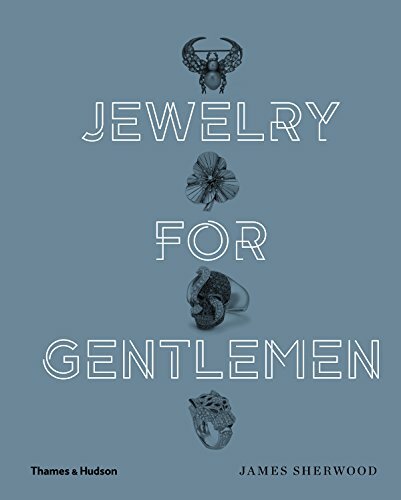 There really aren’t enough superlatives to describe this book; Jewelry for Gentlemen is so much more than what one should expect from a book with such a simple title. Truth be told, James Sherwood has organized an assemblage of information and visuals that is so wonderfully written and executed that any prospective reader will revel in its reading. Jewelry for Gentlemen is not the common regurgitation of information about Tsars, Maharajas, Romanovs, royalty who lavishly adorned themselves in exquisite unfathomable jewels from the likes of Faberge, Van Cleef, Cartier, Boucheron, and more. Of course they are all included, but what sets this book apart is the successful melding of information about what was and what is when it comes to jewelry for men from past to present. The photographic images are breathtaking in detail and further heightened by the enlightening text which is written to “speak” to an informed reader not a jewelry expert/gemologist as is the case in many books of this genre. The terminology usually exceeds the knowledge of the reader but not here, not in Jewelry for Gentlemen; Sherwood writes intelligently, informatively and most of all in a way that pulls the reader into the subject matter by examining the past, present, and future of the revered heritage brands as well as the contemporary visionaries who inhabit this rarefied world. In addition to all that Sherwood also offers trends for collectibility value, appeal, and growth potential within each of the categories. Another aspect that Sherwood explores is “the dealer” who sells jewelry for gentlemen; in other words the retailer who buys with the modus operandi of reselling. Seldom does an author of this genre speak of the dealer since more often it is all about a brand, a trend and the gems that are strictly available through their own points of sale. This author provides a different perspective for the reader that is not often, if ever, examined. Sherwood highlights the works of Shaune Leane, Solange Azagury-Partridge, Stephen Webster, and more who are rarely spoken of in the same breath as the established marquee brands. They are the present and future of what will become heirloom and collectible jewelry for gentlemen of every age.